The Research Excellence Framework also assesses the impact that the research has outside academia. The case studies below are a selection of the research submitted by the School of Engineering and Digital Arts. 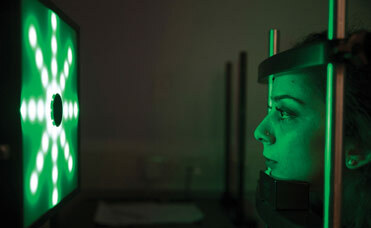 Kent’s research on biometrics – the identification of individuals through their physiological or behavioural characteristics – has led to significant developments within industry. At present, analysing the unique patterning of the iris within the human eye is one of the most popular methods in use. Research at Kent, in collaboration with British company Smart Sensors, has developed new ways to improve iris recognition systems, overcoming previous constraints such as the need to direct the gaze straight at the camera. The approach developed at Kent is flexible enough to deal with multiple gaze angles in varying light conditions. The team has also worked on areas such as handwriting and signature recognition, as well as facial recognition. Michael Fairhurst has been influential in the wider debate on the use of biometrics, advising the UK Government on the technology for biometrics, as well as related ethical and privacy issues. Wi-Fi connectivity and mobile phone coverage can be problematic in buildings with signal blockage and interference. Research at Kent has tackled this problem with the design of antennae and frequency selective surfaces (FSS) that can be intimately integrated into buildings. Kent has also developed antennae for vehicles. Collaboration with Harada Europe led to integrated antennae that take advantage of roof panels, boot lids and bumper mouldings. More recently, work on skin-mounted antennae led to printed transfer tattoos of radio-frequency identification tags. Such tags can be used for security and ticketing, or for hospital patients, to ensure their medical regimes are followed.